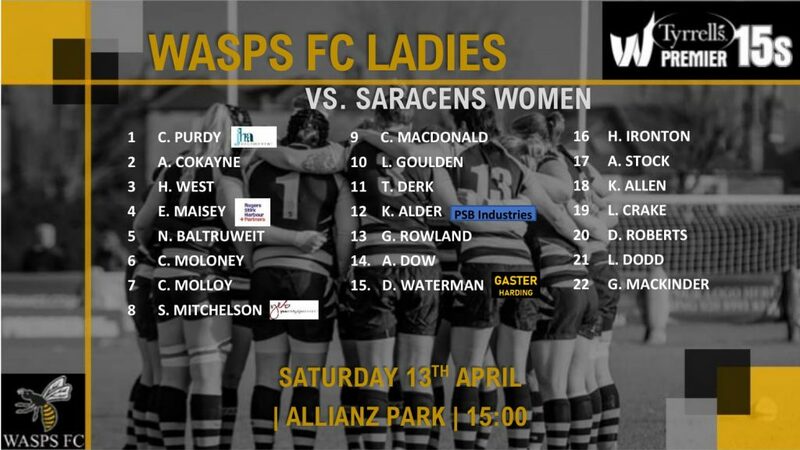 Wasps travel to Allianz Park this weekend for the Premier 15s semi-final against Saracens. The visiting side have finished the season in fantastic form in some highly competitive fixtures, to put them in good stead for a clash with the league leaders. It is sure to be a thrilling encounter with a place in the Premier 15s final up for grabs. There are four changes to the starting line up from the side that defeated Bristol Bears at the Big Swarm two weeks ago. The only change in the backline sees Welsh international, Gemma Rowland, coming into the centre pairing with club captain Kate Alder. In the front row, Wasps swap one experienced England international for another, as Claire Purdy picks up the starting place from Rocky Merchant-Clark. Emily Maisey returns to the starting line up in the second row. Cliodhna Moloney joins her fellow countrywoman, Claire Molloy, in the back row, fresh off a very strong performance against her former club last weekend. The black and gold side secured their playoff spot three weeks ago when they won a crucial match against Gloucester-Hartpury in front of a passionate crowd at Kingsholm. The final regular season game was a tough battle against a physical Bristol Bears side, where Wasps defence shone through. There was also a friendly fixture against Irish club side Railway Union last weekend, to ensure players had much needed game time ahead of the semi-final. Wasps are one of only two sides to beat the current champions since the formation of the Tyrrell’s Premier 15s, winning a low scoring affair at Twyford Avenue last season. Ten of the matchday squad from that fixture last year, will be pulling on the black and gold again this weekend. Make sure you don’t miss this incredible matchup and get down to Allianz Park for a 15:00 kick-off tomorrow (Saturday 13th April). Tickets are available in advance on the Saracens website and on the gate. For those unable to make the journey to support the team in person, the game will be live streamed on England Rugby’s website, Facebook & YouTube.